St. Patrick's Day weekend, notorious for its rambunctious crowds and never-ending pitchers of beer, is less than two weeks away! The holiday shouldn't just defer to green beer (though cheers to that! )—Its Irish heritage and homage to spring's arrival call for an elegant St. Patty's set-up. Thanks to Memphis' gifts and interiors shop Bella Vita, we've accomplished a stunning spread that'll make your guests feel extra lucky this year. Keep scrolling for details...and cheers to a special St. Patrick's Day! Though emerald is my birthstone and green is literally in my last name (which helped me avoid getting pinched in grade school!) , bright green will never be my go-to color. However, when I graced upon Bella Vita's Good Earth pottery in "celery," my perception of green was reversed—It's my new favorite tone! The cozy pottery dinnerware set—which you see in the gumbo bowl, bread tray, and barrel mug—lays beautifully against our wood-grained dining table. I especially love that the celery hue nods to the bloom of spring while embracing autumn earth tones or a tranquil winter. Its versatility will complement any future gathering, in my opinion! 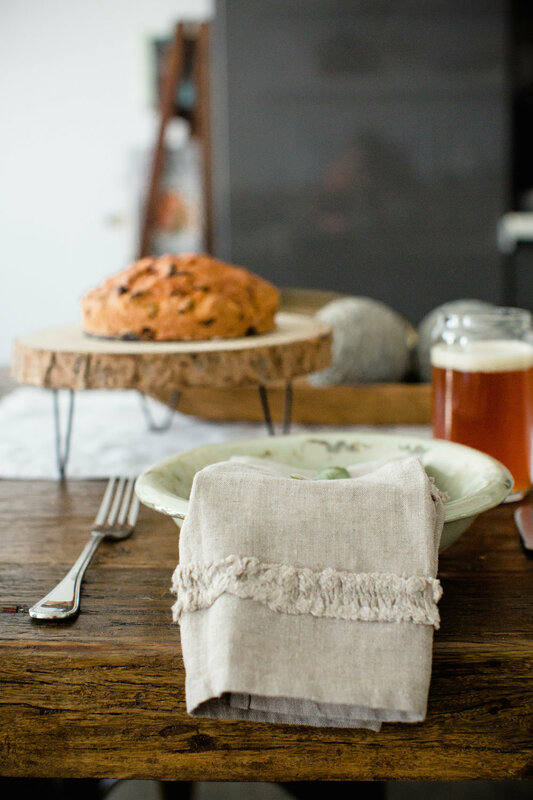 Ruffled linen napkins grace each place, adding an extra layer of richness to the table's earthy patterns. For this tablescape, I treated the massive cheese board and Irish soda bread as centerpieces, if you will! Encourage each of your guests to bring his or her favorite six-pack of beer to the party, whether Irish or local or extra hoppy. Store the bottles in an oversized galvanized tin, though you'll be pouring into Pilsner glasses in a matter of minutes! For a post-dinner drink (or headliner, if you're kicking this menu off at brunch time), Irish coffees in mugs are spiked with Irish whiskey, dolloped with whipped cream, and dusted with nutmeg. The mix of sweetness, spice and punch is perfectly in sync for a St. Patty's party. We always begin with the cheese boards, don't we? The foundation for our St. Patrick's Day special cheese board is technically a bread tray by Good Earth in "celery." Anchored by an Irish cheddar's complex and worldly flavor profiles, green Castelvetrano olives and cornichon pickles add a pop of holiday-appropriate color. Olive crackers and fresh herbs achieve the organic, earthy tone of the evening. Slices of Irish soda bread welcome a spread of the mild, creamy goat cheese, which I added to balance the sharp cheddar. The term "bangers and mash" is a classic, so I opted to elevate the traditional Irish plate for our affair. Traditional mashed potatoes are welcome, though a parsnip purée with roasted garlic (and butter and milk, of course) makes a remarkable base for this dish. Bratwursts are boiled in beer before caramelizing in the oven at 400 for 8 minutes—then, topped with a spoonful of caramelized onions, fresh sage and thyme. Bon appetît, and Happy St. Patrick's Day! This post is brought to you by Bella Vita. Thank you for being supportive of my sponsors!